This is a beautiful, light-filled vacation rental with vaulted ceilings and wonderful new furniture! 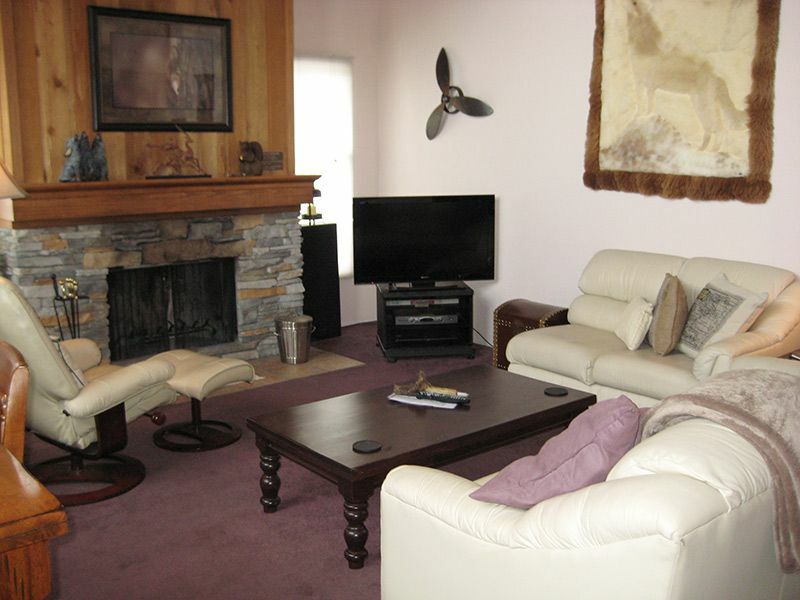 It is also located right next to the pool and jacuzzi area at Val d'Isere. This condo is a nonsmoking, 1-bedroom and a loft unit with 2 bathrooms and a 4 star rating. It has a full kitchen, microwave, fireplace, 3 TVs (flat screen in living room), 2 DVD players, stereo with a cd player, free wireless internet access and a phone. It also has a great view of the Sherwin Mountains from the balcony and is located across the street from the new Village at Mammoth and Village Gondola. The living room has a queen fold-out couch, the bedroom has queen size bed, the loft has a king size bed and there is a single bed under the stairs in the entryway. There is one flight of stairs to reach this unit and it is 2 levels inside. The entry level has the living room, dining room, kitchen, the bedroom and a bathroom. Upstairs is the loft with another bathroom. This unit sleeps up to 7 people. Unit managed under Mammoth Lakes Business Tax Certificate 864. A bit dated, but comfortable and perfect for a family of four. This property is in a great location, right next to the village. Hot tub right next to the unit, which is very convenient! Beds super comfy (contrary to what a previous review said...maybe they got new beds since then). Overall furnishings comfortable. Kitchen and bathrooms ok, but could use some upgrading...if anything the owners should at least invest in a new coffee maker. It is very old and would be an easy thing to upgrade. We enjoyed our stay. Overall, it was fine. Close to the village, ski back trail, and amenities. It was clean and had well placed instructional signs. I gave it a 3 because considering the price.... The beds were uncomfortable, the bath tub water had a leak and NEVER stopped running (dispite informing management this was not fixed), there was several large dog poops on property (2 right where the ski back trail ended, gross), and instead of stairs there is a long ramp to get to where the condos are...they should really put some no slip strips down with the ice there were several falls, if all ages, that we witnessed during our stay...dangerous.